I’ve been slow to jump on the glorified serum-delivery mask sheet mask bandwagon, but there’s been a few fun ones popping up in the clean beauty space that I couldn’t resist trying. One of those is from OG cleaner beauty brand Yes To and its Yes To Grapefruit Pore Perfection Mask. So, to get it out of the way, Yes To is not a brand for purists. It contains certified organic ingredients (yes!) but also lists “fragrance” on its packaging (hmm). Regardless, it’s a brand that’s perfect for new-to-green-beauty guys and gals, and I’m happy to offer it up as an affordable option to those beginning their clean beauty journey. Now, back to this fun natural sheet mask. It’s pretty much impossible to NOT look like a freakish, Friday-the-13th murderer in a natural sheet mask, but the way it leaves your skin feeling afterward is anything but scary. A quick primer on natural sheet masks: As alluded to in my opening paragraph, these are essentially glorified serum delivery devices, but the beauty of them is that they force you to relax in a cocoon of serum for up to 15 minutes before massaging them in. That allows the serum to marinate your skin in all of its goodness (and in this case, it’s a brightening serum that’s actively trying to lighten and fade dark spots) before you rub it in and call it a night. 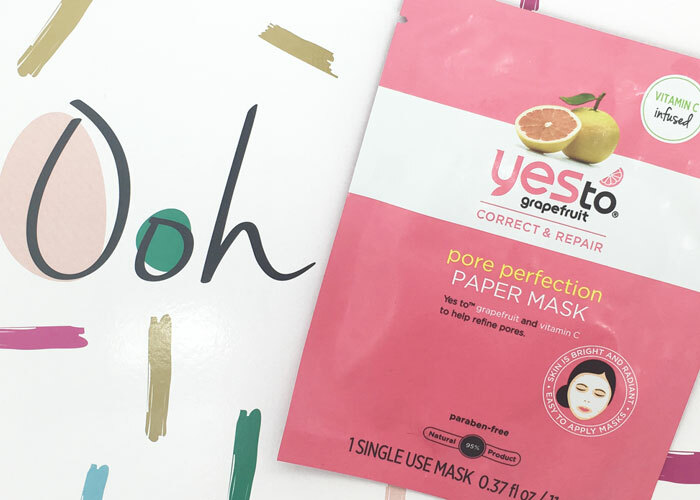 When it comes to Yes To Grapefruit Pore Perfection Paper Mask, you get a perfectly balanced formula made with fermented ingredients and traditional brightening and toning ingredients such as lemon peel, grapefruit and witch hazel. This is all packaged up in a single-use mask (that I like to keep in the fridge) made from Tencel fibers. Because of these radiance-inducing ingredients, I choose to only use this natural sheet mask at night before bed so it can work its magic without worry of sun damage (or layering on sunscreen). Yes To developed this mask to target uneven skin tones (think blotchiness, hyperpigmentation, freckles — the works!) and reports that 85% of its users (based on an independent study) perceived that their skin appeared more even. More than 90% said their skin felt hydrated and softer. While not the most scientific of studies (about as scientific as my opinion-based blog! ), I will echo the sentiment. After using these natural sheet masks once a week for five weeks, my skin has felt a little brighter and less scary post-use. These are a fun, low-financial-commitment indulgence to get a little bit of brightening action and a lot of fun on Sunday spa night. There’s nothing absolutely mind-blowing about the ingredients list, though I do like the use of fermented ingredients if only for the trendiness factor (hey, a brand is paying attention and making it affordable to experiment!). I see no reason why I wouldn’t recommend trying these natural sheet masks if not just for the fun factor. Don’t expect miracles, but hey, if your pigmentation issues are light, it might not hurt to try. Now, who’s sending me a Snap of themselves in a natural sheet mask? Have you tried any great natural or clean sheet masks? Which do you recommend? Are you over this fad? What do you think about fermented ingredients in skincare? Tell me in the comments!